Yamaha has launched the MT-15 in India for Rs 1.36 lakh (ex-Delhi) and we got to ride the bike at the Buddh International Circuit in Noida, the review for which will be up soon. Until then feast your eyes on these detailed images of Yamaha’s newest 150cc naked bike. The MT-15 follows the same design language of Yamaha’s MT naked bike lineup. We love the aggressive and mass forward design. The robotic-looking LED headlight arrangement with its LED running lights is bound to turn heads and we think its single LED projector headlamp setup will work better than the R15’s LED headlamp setup. The massive grab rails that run along the entire tail section look out of place on the svelte looking MT-15. The MT-15’s fully digital instrument console is similar to the R15 v3.0 but features a white on black colour display., It encloses a speedometer, tachometer, a gear position indicator, odo and trip meters, instant and average fuel consumption, range to empty and a VVA indicator. While the international spec MT-15 gets four colours, there’s only two colour options in India and it misses out on fluorescent wheels and instead gets fluorescent yellow rim tape. The wheel design is different from the international-spec MT-15 and is similar to the R15 V3.0. Power comes from the same 155cc liquid-cooled single cylinder motor that does duty on the R15 v3.0. It gets Variable Valve Actuation (VVA) and makes the same 19.3PS and 14.7Nm as the R15. The slick-shifting 6-speed gearbox has a slip-and-assist clutch and worked well for quick upshifts and downshifts while riding on the track. Given that the MT-15 will do more city than track riding, Yamaha have fitter a larger 52 teeth rear sprocket (48 on the R15) to shorten the overall gearing. So now you have a motor that revs faster and has a better bottom-end response but loses out on a bit of top-end performance. The upright riding stance is fairly relaxed. It’s wide and flat handlebar is set low and close to the rider similar to the smaller KTM Dukes. Even the footpegs aren’t too rear-set and don't stress your lower body much. The MT-15’s 810mm seat height (5mm lower than the R15’s) is on the taller side but given the bike’s narrow width and low weight, it’s easy to ride and push around in the parking lot. The one-piece seat is scalloped at the rider’s side but has enough room for back and forth movement. Conversely, the pillion side is small and your pillion rider is going to have a difficult time sitting behind. Like R15 v3.0, the MT-15 misses out on the upside-down forks of the international bike and instead gets conventional telescopic units. It even misses out on the international MT-15 or India-spec R15 v3.0’s cast aluminium swingarm and instead gets a steel box-section swingarm. The upright riding stance keeps weight off the front wheel and the wide handlebars provide more leverage. These factors make the MT-15 extremely quick to turn in at the slightest input. The MT-15 gets non-radial, bias-ply 100/80-17 (front) and 140/70-17 (rear) MRF Nylogrip Zapper tyres. These are the same ones as the R15 V3.0. It also misses out on the Metzeler Sportec M5 radial rear tyres that come optional on the R15. Brakes have been carried over from the R15 v3.0. It gets a 282mm front and a 220mm rear disc and while the R15 v3.0 gets a dual-channel ABS setup, this makes do with single-channel ABS. 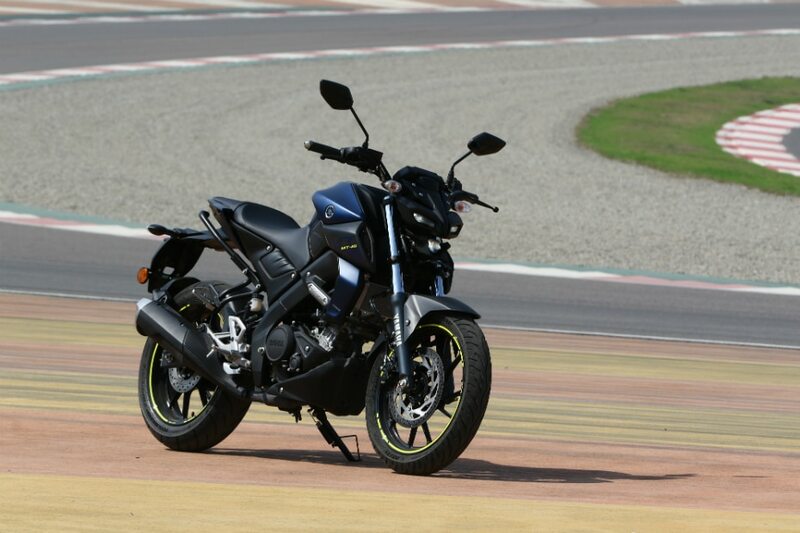 At the MT-15’s asking price of Rs 1.36 lakh (ex-showroom Delhi), it is Rs 3,350 cheaper than the R15 V3.0. For that price difference, you miss out quite a lot especially, the aluminium swingarm and dual-channel ABS. However, we feel the MT-15 has the potential to be a good urban motorcycle. Stay tuned for our comprehensive road test review of the bike.